One of our March Recommended Reads is The Journey of Admiral Bolognaise – the second book in the Captain Blueberry series by Tasmanian writer and illustrator Rachel Tribout. Made possible through a Pozible campaign , this beautifully designed book follows the adventures of one Admiral Bolognese as he decides to prove that monstrous monsters don’t exist…but can he!? Thanks to Rachel for taking time to answer a few quick questions for the TWC blog. Check out her website at racheltribout.com and keep up to date with Captain Blueberry’s adventures on his very own Facebook page. 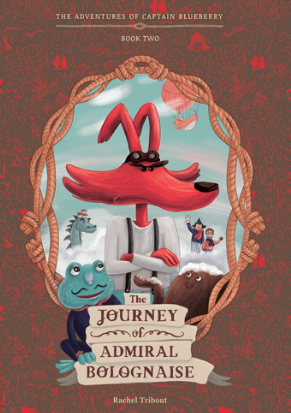 If you’d like to win a copy of The Journey of Admiral Bolognaise, pop over to the Recommended Reads page and find out how to enter. Congratulations on the publication of your second book Rachel! Have you been receiving good feedback on it? Do you find that living in Tasmania has a direct influence on your work? Absolutely. The wild aspect of Tasmania in particular has inspired my books. Although I grew up in the countryside, I didn’t see much real wilderness growing up, but I was always very inspired by old legends and tales that were connected to the landscape. Here there’s so much untouched nature that my imagination runs wild very quickly. I am also very inspired by the nautical aspect of Tasmania; I come from a continental area of France, so the sea, its mystery and old legends inspires me a lot. And who the hell knows what lurks underwater??? Do you feel that Tassie is a good place to be a writer/illustrator in terms of resources and a supportive community? Yes. I know a lot of creative people here, and it feels like it’s a supportive and friendly community. I have received a lot of help from my peers, and I hope I give as much back. It’s a really nice feeling to be part this community. Are you able to share any details of your next project with us? What will Captain Blueberry get up to next?! I don’t want to reveal too much, but I can tell you that Captain Blueberry, Admiral Bolognaise and their friends are likely to stay in Antarctica for at least one more book. I have been looking at old tales and legends related to Antarctica, and there’s an incredibly rich source of inspiration there… and I am not even talking about the fauna and the flora! I am getting very excited again. Now, as usual, it’s about finding/making the time to create the book. Being self-funded, it’s something I only do in my spare time. What would your advice be for someone trying to break into children’s writing? I don’t feel like I am very well positioned to give advice, but I’ll give it a go! Practice practice, write, draw, challenge yourself, experiment, and create a portfolio of work that shows publishers (if you want to be published) that you can do this. Meet with your peers, go to workshops, share your knowledge, discuss your ideas… take your projects seriously, work hard, but make sure you have fun too! Do you have any plans to expand into writing or illustrating for young adults or adult fiction? Yes I would love to illustrate more for adults and young adults. I have already been part of some projects that were not destined for children, mostly illustrating covers, or essays and poems. (I recently illustrated Mark Clemens’s last book, Small Journeys, which was incredibly meaningful for me.) I also work a lot as a commercial illustrator so I have a few different visual languages up my sleeve. I am very keen to explore other kind of story telling, especially illustrating other people’s text. I would love to illustrate a longer tale, or a series of essay, or even a graphic novel. I am open to propositions! Do you test your books out on children you know first to get their reaction? I don’t have any children, but yes, I test the books on my friends’ kids. It’s very valuable, and I sometimes need to adjust the text or illustrations depending on the feedback. Who are your own favourite writers and illustrators? This could be a very long list! My favourite illustrators are: Shaun Tan, Carson Ellis, Julia Sarda, Amelie Flechais, Ryan Andrew, Tomer Hanuka… and many more! Fave writers: Jonathan Franzen, Haruki Murakami, Chateaubriand, Ursula Le Guin, Philip Pullman, Wilfrid Lupano and many many more. 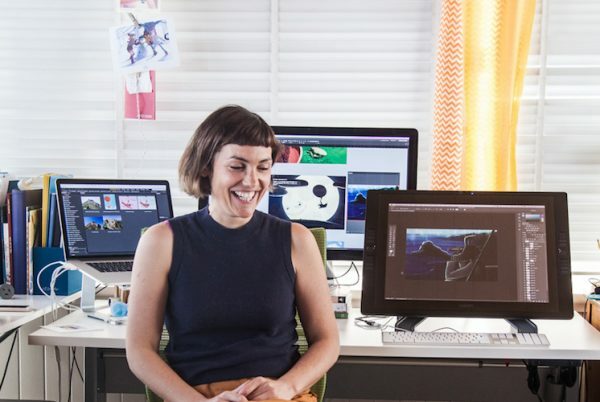 Do you have advice for other creatives who are considering crowdfunding a project?